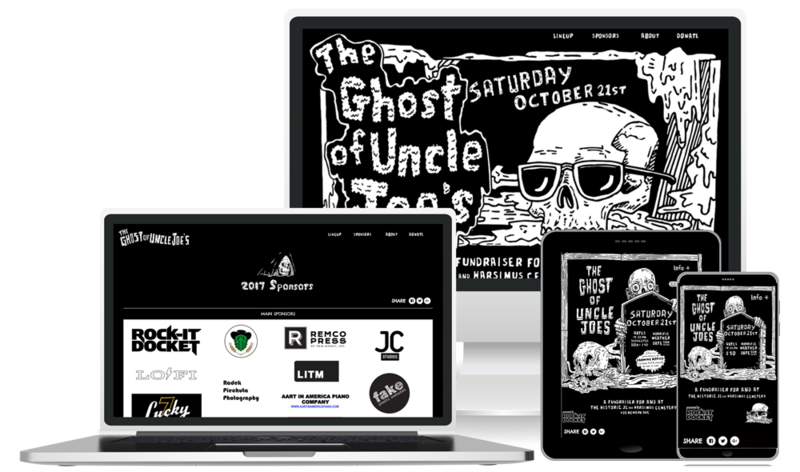 Fake Plastic Websites has been a partner to Jersey City’s Rock-it Docket for some time and our favorite annual collaboration is always The Ghost of Uncle Joes Halloween Costume Ball & Fundraiser (aka: The greatest Halloween party ever). This year, we decided to give the celebration some focused attention with its own dedicated website. The event, which occurs annually every Halloween, is a benefit concert for The Historic Jersey City and Harsimus Cemetery. The event, which takes place on the cemetery grounds features local musicians dressing up and performing songs of famous bands. And these acts are no joke. Guns N’ Roses, Led Zeppelin, Radiohead, Joy Division and the list goes on and on. To learn more about past and future events, check out the new event website.